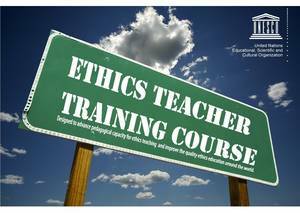 The Ethics Teachers’ Training Course will be delivered jointly by UNESCO and the Kyrgyz State Medical Academy in Bishkek, Kyrgyzstan on 4-8 November, to advance quality ethics education by building professional capacities of ethics teachers in the county and in the wider Central Asian region. Ethics Teaching Training Courses is conducted by a team of experts with extensive experience in ethics education, including the experts from Central Asia. •	Good command of the language of instruction (Russian). •	Content of the motivation letter (minimum of 600 words), stating the applicant’s reasons for participating in the course and expectations concerning the use of the acquired knowledge. There is no tuition fee for participating in ETTC. However, the participants are expected to cover the charges related to their travel to the venue and their accommodation. Low cost accommodation options will also be available for the participants accepted for the Course. •	Universal Declaration on Bioethics and Human Rights. •	Bioethics Core Curriculum, Section 1: Syllabus. Ethics Education Programme, UNESCO, 2008. •	Bioethics Core Curriculum, Section 2: Study materials. Ethics Education programme, UNESCO, 2011. •	Casebook on Human Dignity and Human Rights, Bioethics Core Curriculum Casebook Series, No. 1, UNESCO, 2011. •	Casebook on Benefit and Harm, Bioethics Core Curriculum Casebook Series, No. 2, UNESCO, 2011. Each participant will also be expected to select any topic in ethics, based on their own interest and expertise, and prepare a 15-minute teaching demonstration on this topic, to put into use the ethics teaching approaches showcased during the Course. The audience of this presentation will be the group of fellow participants as well as the course facilitators. The facilitators will provide immediate constructive feedback and suggestions. For additional information, please contact Ms. Arina Myassoyed in Almaty Office of UNESCO (a.myassoyed@unesco.org).